MORRIS TOWNSHIP, N.J. - After a normal takeoff and a routine conversation with air traffic controllers about potential icing conditions, a small plane carrying two investment bankers and three others to Georgia headed off into the skies over New Jersey on Tuesday morning. Minutes later, the high-performance Socata TBM-700 turboprop had spun out of control and crashed in a fireball on a busy highway, killing all five people aboard and narrowly avoiding dozens of cars and trucks speeding by. Federal investigators were to resume searching the area for wreckage Wednesday morning. 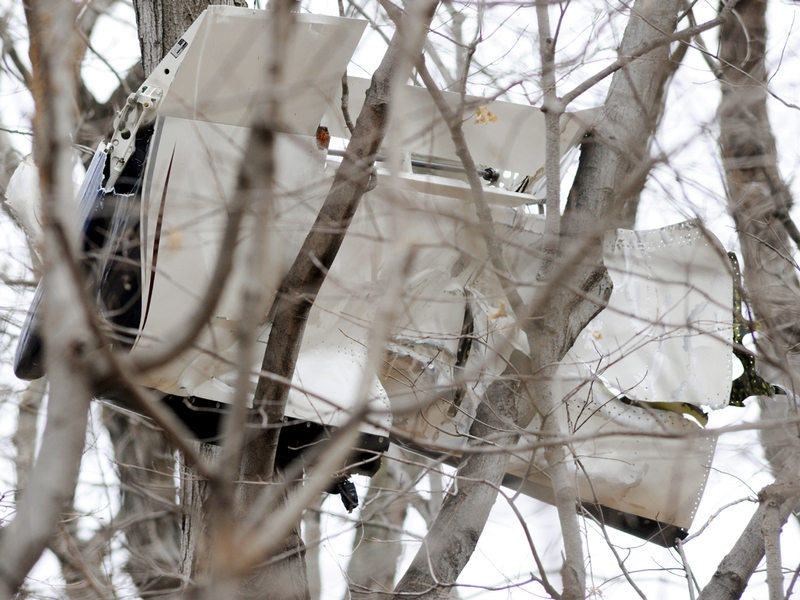 The debris was scattered over at least a half-mile, with one section found lodged in a tree a quarter-mile away. The crash closed both sides of busy Interstate 287 for hours on Tuesday. The New York investment banking firm Greenhill & Co. said two of its managing directors, Jeffrey Buckalew, 45, and Rakesh Chawla, 36, as well as Buckalew's wife and two children, were on the plane. Buckalew was the registered owner of the single-engine plane and had a pilot's license. National Transportation Safety Board officials said Tuesday the plane wasn't required to have a black box, which would have recorded flight data, but they said investigators would be searching for other memory devices, including GPS, collision avoidance systems or any device with a recordable chip that might yield more information. The NTSB didn't say what role icing may have played in the crash. But an audio recording available online of the pilot speaking to air traffic controllers in the minutes before the crash offered some early clues. The pilot was told to maintain an altitude of 10,000 feet as he headed southwest over northern New Jersey as a controller warned him about the conditions in the clouds above  specifically accumulations of ice particles known as rime. "There are reports of moderate rime. ... If it gets worse let me know and when center takes your handoff I'll climb you and maybe get you higher," one controller said. The pilot responded: "We'll let you know what happens when we get in there. And, yeah, if we could go straight through it, that's no problem for us." Seconds later, another controller is heard telling a different pilot about reports of severe icing at 14,000 feet. Ice can form on airplanes when temperatures are near freezing and there is visible moisture, such as clouds or rain. The ice adds weight to an aircraft, and rough accumulations known as rime interrupt the flow of air over wings. In extreme cases, a plane can lose so much lift that it falls out of the sky. Several eyewitnesses to Tuesday's crash described an out-of-control descent. Will Keyser, who works in maintenance at the Spring Brook Country Club in Morristown, is used to hearing small planes fly over en route to nearby Morristown Memorial Airport. He was near the 13th hole Tuesday when he heard a loud plane overhead. "It didn't sound quite right," Keyser said, recalling how he and his co-workers all looked up simultaneously. "We kind of lost it in the clouds, it came out of the clouds on the other side of the course, and it didn't look right, it didn't look like the pilot had control." Keyser said the plane pitched back and forth, and for a moment he thought it was a stunt pilot. "It was kind of rolling and making circles  'cause I've seen air shows before  so I thought: `Oh, OK;' but then he finally did a nosedive and we realized that was completely wrong." Greenhill & Co. said Buckalew's wife, Corinne, and the couple's two children, Jackson and Meriwether, were traveling with him. "The firm is in deep mourning over the tragic and untimely death of two of its esteemed colleagues and members of Jeff's family," the company said in a written statement. A resident at Chawla's Manhattan apartment building remembered him as being constantly on the go, leaving early and getting home late. Arthur Yellin said that Chawla and his family were "wonderful people" and that the banker doted on his three children. Authorities said a dog aboard the plane also was killed.